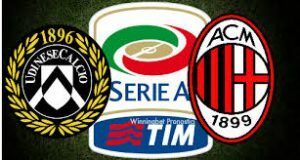 Udinese welcomes Milan in a last match from the 11th round of the Serie A. These two teams will meet on Sunday night at the Stadio Dacia Arena in Udine. Let’s see what’s going on with them. Udinese are currently 16th in the Calcio with 9 points won. Their record so far shows 2 wins, 3 draws and 5 losses. Right now the team is just 3 points above Empoli and the relegation zone, so surely they are in a need of some points. In their last five matches Udinese can’t say that they are doing well – they suffered four defeats and made one draw. The only point they won in these five matches was against Genoa at the Stadio Luigi Ferraris. This game ended with a 2-2 draw. The goals for Udinese were scored from Kevin Lasagna and Rodrigo de Paul. Before this draw, Udinese suffered four consecutive losses against Napoli, Juventus, Bologna and Lazio. Milan are enjoying their return to the Top 4 of the Serie A. The Rossoneri are currently 4th in the league standings with 18 points and a record of 5 wins, 3 draws and 2 losses. Gennaro Gattuso’s team returned in Top 4 after a win over Genoa during the week. Suso and Andrea Romagnoli scored for the San Siro giants. Udinese can’t use Bram Nuytinck and Svante Ingelsson for this game, while Lukasz Teodorczyk, Giuseppe Pezzella and Darwin Machis could miss the game because of injuries. Milan can’t use the injured Lucas Biglia, Mattia Caldara and Ivan Strinic, who are recovering from injuries. Giacomo Bonaventura is also doubtful because of his knee injury. These are the team news before the Serie A clash between Udinese and Milan at the Dacia Arena in Udine. We wish you a good luck with this one.